Judging the value of your Walking Dead #1 comic book depends on the condition and the color of the “Mature Readers Label” – At one time, most collectors were willing to pay a bit more for the black label version, as it was considered to be slightly more rare. However, it appears sometime in 2015, the market demand shifted just a bit to where White Label versions were selling for as much or more than black label versions. If you have a book in perfect condition, it might be worth getting it graded, as mint copies can sell for quite a bit more than ones just slightly less mint. For the most up to date price, view the recently recorded sales online, however I’ve also included a date next to values below for when the values are recorded from. Q1 2016 Market Update: The values for CGC 9.8 Black Label Walking Dead #1 comic books trended up from previous values. It appears most collectors are comfortable spending at least $2k for the comic book in near pristine condition, versus values in the $1,800 range previously. Q4 2016 Market Update: Walking Dead #1 Black Label comic books were up an impressive 30 – 40% nearly across the board on the higher end (CGC 9.8 and 9.6) graded comic books. The “lower end” CGC 9.4 and under increased in value by approximately 10 – 20%. Q1 2016 Update: Only a handful of CGC 9.8 and CGC 9.4 graded White Label Walking Dead #1 comics sold online during the course of 2015. The values trended up as the year went on, up roughly 20% from where they were in 2014. Q4 2016 Update: Values increased rapidly over the course of the year. CGC 9.8 & CGC 9.6 graded books were up 30 – 40%. CGC 9.4 and lower graded books were up a more modest 10 – 20%. Wizard World Show attendees were treated in 2013 with variant cover art on a reprint of The Walking Dead issue #1. Sketch versions also exist. These variant covers are often worth between $150 – $250 in high grade condition. They are often signed by Moore and Kirkman, but that doesn’t raise or lower the value tremendously at the current time. 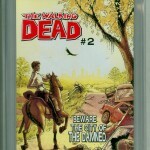 The Walking Dead has been referred to as a phenomenon among comic book collectors and fans of the TV show. 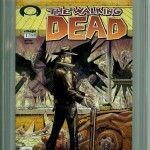 Over the last several years, the value of The Walking Dead issue #1 has climbed to heights usually only seen by the golden age of comic books. 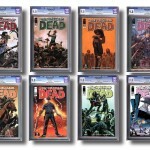 Below is a record of prior recorded sales for Walking Dead #1 comic books sold on eBay. The price has steadily increased almost Q/Q since we began tracking values.